I have posted before about turning an outfit into a room. One of my resources noted was Domino Magazine as they often feature this inspiring idea. Well the May '08 issue steps it up a notch by turning a movie into a room. Highlighted classic film- The Graduate (1967). I love how effortlessly the design team re-creates the aesthetic and feel of the popular movie. 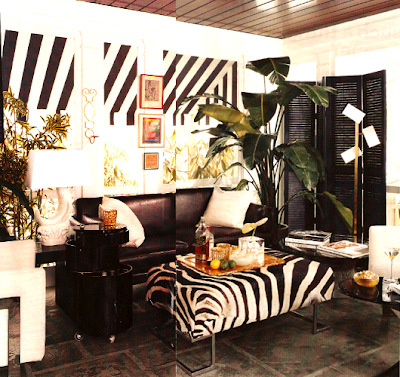 I epecially love the black plantation shade room divider, pop of yellow from the lemon and the scale of the palm tree. 1 Response to "DOMINO TURNS A MOVIE INTO A ROOM"